It's rather difficult to believe that we once lived in a world without the internet. Who would have thought 20 or 30 years ago we could reach in our pockets, pull out a device and have the world at our fingertips? It's staggering to think that we are more technologically forward than they were on Star Trek. Most of Dr. McCoy's equipment could be replaced by various apps now! When I started on my 2 wheeled journey, most of my knowledge came from a wonderful set of books issued in the late 1970's. This is a very thick alphabetical tome that is incredibly useful for learning about various Marques. 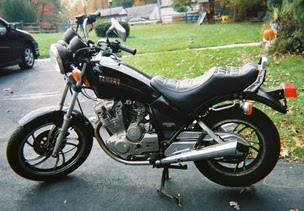 I was fortunate enough to have one given to me by my father when he went to the National Motorcycle Museum in England. While I would dream of bikes and read about them, I longed for the day when I would be a part of that world and have a machine of my own. That day came a couple of decades (and some change) ago when I was working odd jobs in high school. That summer was a rough one for employment, the recession had hit many industries in my town hard and student work was scarce. I worked with an employment agency who set me up with various temporary assignments; everything from digging holes, working in garden centers to helping erect circus tents. It was at this last job that I started a conversation with a young man scraping up the cash to buy a sticker (this is a yearly tag purchased for one's licence plate in Ontario) for his Mustang. I am not sure how we got on the topic or how the deal came about; I just know that by the end of the night, I agreed to surrender my days pay in exchange for a Yamaha, sight unseen. I guess my desperation to own a bike must have taken over! The next day, I took the bus down to the other end of town and laid eyes on a very sad machine. This didn't dull my enthusiasm unsurprisingly. The Yamaha turned out to be a 1982 Maxim 400, one of the ugliest things I have ever seen on two wheels. It was as far from a shiny Bonneville as one could imagine, but it was a start. Truthfully, I was hoping it was a 70's XS650, at least that Looked British. As this was the pre-digital era, I don't have an actual snapshot to share. I do my best to avoid reposting content from other sites, this time I had no choice. Mine never looked this clean, by the way. It had shoddy tires, a ripped seat, electrical problems and scandalous amounts of rust! When I think about it, the bike wasn't that old at the time, it must have had a tremendously hard life. I parted with my hard earned $75.00 and hoped for the best. I was told a new battery and fresh gas was all that was required to get it going again. If memory serves, a friends mother with a truck got the bike home in exchange for a day's worth of yard work. I can't complain, she threw in a helmet as well. It was a snowmobile helmet that was ill fitting, but what the hell. I had no manual or real resources to assist me; At least I knew how to get gas and buy a battery! I left the items in the backyard with the bike and looked for any tools that might help with the long afternoon of work ahead. While in the house, I heard a loud roar and ran to the alleyway behind our yard. This was just in time to see my dad hop on and take off down the road! This was his first ride since selling his Matchess G11 back in 1960. After showing me a few pointers, I set off....what a thrill that first ride was! Stopping the first time was somewhat less enthralling....I hit a fence. While I could not afford insurance and a plate, my adventures were restricted to the alleways. I began to spend a lot of time thinking about how I could make this machine less ugly. The Mad Max styling was truly putrid, it had to go. The big issue? I had no idea who to see or where to go for help. Recently I was having a conversation with a respected Triumph parts dealer who claims he avoids forums like 'The Plague'. Too much misinformation, ignorant people and dangerous advice. I see his point, he comes from the old school and many people online are just guessing it seems or prescribing technical advice from long memory. One of the things I will do from time to time on this blog is debunk myths and try out various products and applications. This will hopefully save some of you from purchasing tonics, sprays and other concoctions that will collect dust on your shelf for years to come. Never mind the wasted time and effort. This time around I will focus on chrome removal. 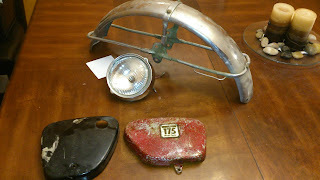 When I examined the rear mudguard on the Dual Twin, I realized that even cleaned up it would be an eyesore. 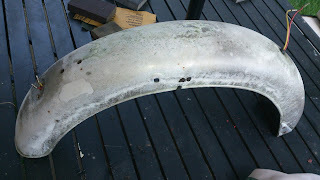 Too much scarring from rust and spots that had rusted right through. Chrome shops are not as common in Canada as they used to be. There has been significant changes to environmental law that has made the practice very, very restrictive. The chrome shops that will actually take motorcycle parts are very expensive and nowhere near me. This same legislation has prohibited the sale of many excellent products that one has to cross the border to attain now. That is a story for another day, however. After spending some time surfing around, I found a variety of methods to strip chrome chemically. Muriatic acid and Easy Off oven spray were popular ones. The acid can be found at home depot or anywhere that services or sells swimming pool supplies. I decided to use the easy off method, primarily because I had it on hand! Myth Debunked! As you can see, the chrome is still present on the mudguard. Oven Cleaner will NOT remove chrome, however it is excellent for cleaning grease and gunk, even some paint off of things like frames and center stands. If you do use it for this purpose, wear a mask and do not do it in a contained area, the fumes can be very harsh. 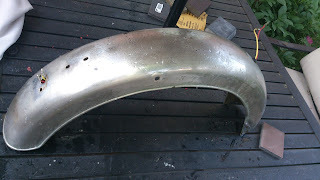 On The Bridgestone front, I dropped the frame and various pieces off for black powder coat. I should have pictures very soon as I am picking them up tomorrow morning. Not pictured are the new bars and new top yoke. Things are moving! Humble Beginnings and Mysteries solved!